It is neither immoral nor unethical to look for ways to reduce one's tax liability. The 15.3% self-employment tax asserted against sole proprietors, farmers, partners, and others is an enormous burden for the typical taxpayer. 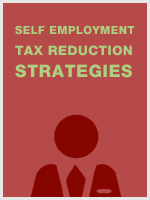 This unique class provides strategies to reduce self-employment taxes by implementing effective tax planning techniques. Contesting a Form 1099-MISC — line 21 or Schedule C? LLC guaranteed payments or one-time payment?